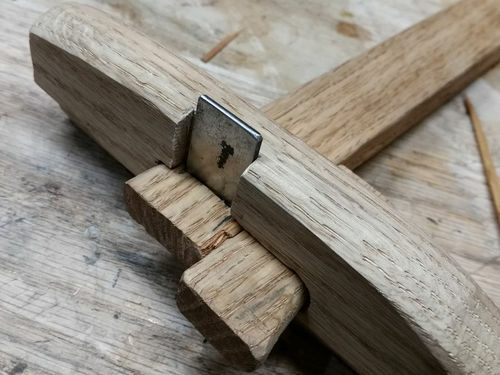 So for those who don’t know, a Wari Kebiki is simply a different form of the Japanese marking gauge (sometimes referred to as a Suji Kebiki). 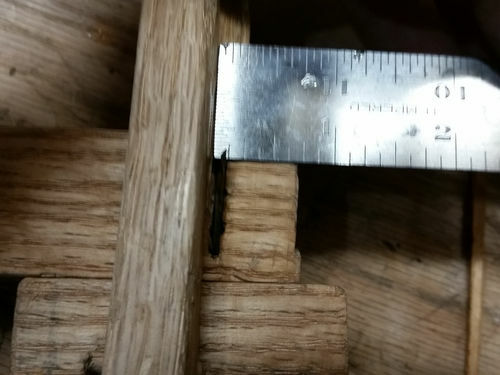 The standard marking gauge as the name implies is designed to mark/score the wood in a fashion to keep measurements and to maintain a straight line with the edge of your stock. The Wari Kebiki however is a bit different. 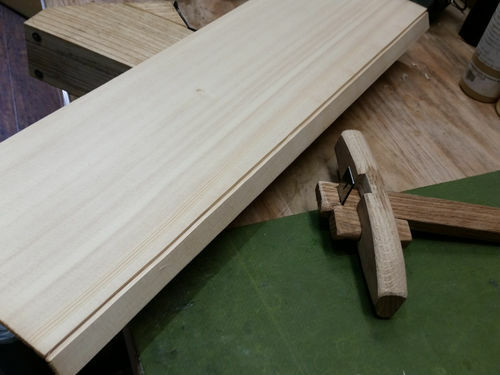 Rather than simply marking the wood the blade of this kebiki is much thicker and bigger, it is designed to split/cut the wood rather than just score the surface. 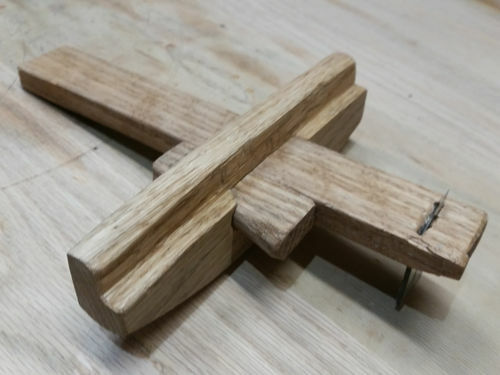 According to Odate this little tool was very important in the making of shoji doors (the little paper panel doors in traditional Japanese homes) as well as Kumiko work. The splitting action works for thinner stock and keeps you from having to sit around for a long time just making long rip cuts in thin stock. With the Wari Kebiki you can make rip cuts accurately, quickly, and with little effort. There is a learning curve to using it however, with practice it becomes pretty second nature fairly quickly. 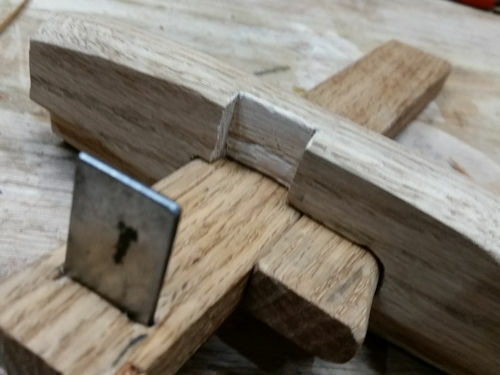 The process of making one is identical to a standard kebiki except for this tool I decided to try a rounded wedge for the lock instead of a square one. 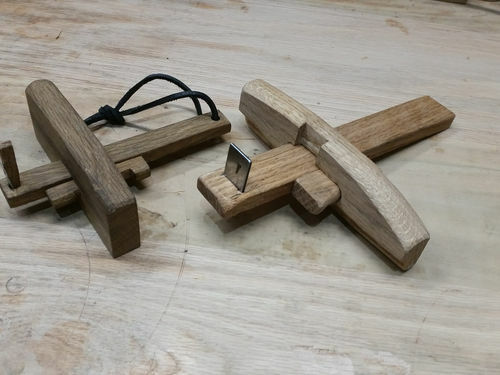 So far it is working very well, it just takes a little longer to make one in this manner compared to a squared off design for the lock and beam. In researching this project I found many that were made in all different styles, some with screws and nails, some glued together, they seemed to vary alot depending on the worker’s preferences. A typical feature of a Wari kebiki is the step that is cut out of the body. According to Odate this is to help the gauge register against the stock that is being worked on. I also noticed that it helps the user put alot of downward pressure on the tool as opposed to the sidewards pressure that is used with a standard marking gauge. A feature that I added to this one that isn’t on all of them is the cutout for the blade. When you cut the step you extend the closest measurement that can be cut by the blade is limited by the step to body distance. When you add the cutout you can get very close cuts since the blade has somewhere to go instead of stopping at the wall of the body. The closest cut that is obtainable on this one is a little under 1/8th of an inch (For you metricals that’s a little under 3.2mm). Since the blade on this tool takes extremely deep cuts in a few passes I plan on using it for things like rabbets, dados, anything that requires a long straight line. The score lines can be made deeper depending on the set of the blade and the amount of pressure used when making your cuts. So cutting a shallow rabbet is very easy. With my test cuts I was able to cut the a rabbet out of mahogany and just peel the waste out with my finger tips. And for my day job which is guitar/stringed instrument repair it’ll serve nicely to help quickly make patches out of spruce. The stock I work with alot is quite thin, and two passes from this quickly gives me a very straight cut with little to no corrections that need to be made. I can quarter up the strips for patches easily, making the initial cut off of the stock is where a saw is nasty (Causing lots of blowout, splinters etc…). So using the wari kebiki comes quite natural to this kind of work. I was still shaping the body when the photos were taken so there is some discoloration since I hadn’t completely finish the corners. One very important thing about this type of tool is that is ONLY works well on straight grained stock. Lots of knots/wavy young grain does not tend to do well. I have tested it on some hardwoods but it’s really better suited to softwoods. With hardwood it will work you simply have to increase the number of passes to get a deep enough cut to split it. 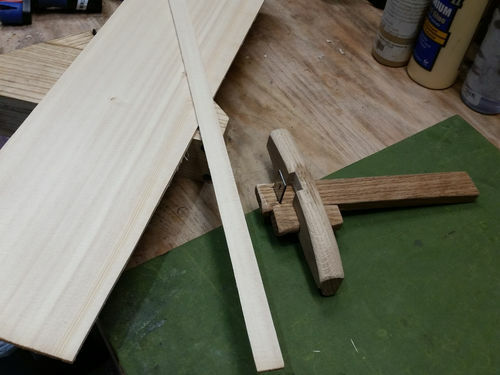 Typically with thicker stock you make your passes on both sides of the wood and then strike the edge with a hammer to break it off (see the video for an example of this). 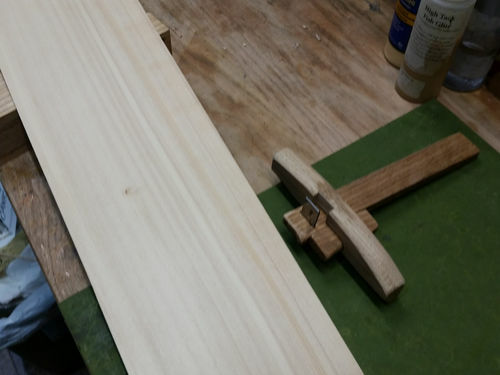 The blade also compresses the wood slightly on thicker stock so you are supposed to soak it in water to let the wood move back to it’s shape before you do any planing or cutting work. And I can just peel it off with fingernail pressure. This was a very fun project with alot of learning involved. I will be using this little guy alot along with my other kebiki I made a few months back. Thanks for reading/watching! This is a very nice and practical shop-made tool.